Retinopathy is the decay of the retina, which is the inside “background screen” of the eye on which the lens projects it’s images. The term retinopathy covers many afflictions, which all relate to problems with this screen that actively translates the images it receives through the lens and transfers them to the optic nerve, which “wires” the pictures to the brain. The retina is an extremely precise and delicate tissue, rich in numerous very tiny capillaries, feeding the fine structures of the retina. Evidently, vascular problems compromise the retina’s functioning and lead to vision impairment, which manifests itself strongly in diabetics. Microvascular complications, such as retinopathy, are especially a problem for people who suffer from diabetes. The long-term consequences of diabetes involve the decay of the entire vascular system. Degeneration of the coronary arteries can lead to heart attacks. Degeneration of the cerebral arteries can lead to stroke, and degeneration of the arteries in the legs can lead to gangrene. Neuropathy (nerve damage) occurs mainly in the feet, causing ulcers that are difficult or impossible to treat and even necrotic tissue. In some cases, toes and the lower parts of the legs need to be amputated. Further complicating cardiovascular health is the propensity of diabetics to develop atherosclerosis. OPCs form the natural nutritional factor in the management of these (micro-) vascular problems. OPCs do not play a role in the dietetic management aimed at keeping normal blood levels of sugar and fat. In that sense, OPCs do not replace insulin and no attempts must be made to use OPCs for this purpose. In the case of diabetics, OPCs’ role is confined to supporting the vascular system to resist the vascular effects of this condition. Because of their capacity to give dynamic support to the vascular system, OPCs were profoundly and successfully researched in cases of diabetic retinopathy. The effects of a recommended daily dosage of OPCs were measured in 147 retinopathy patients (1978). 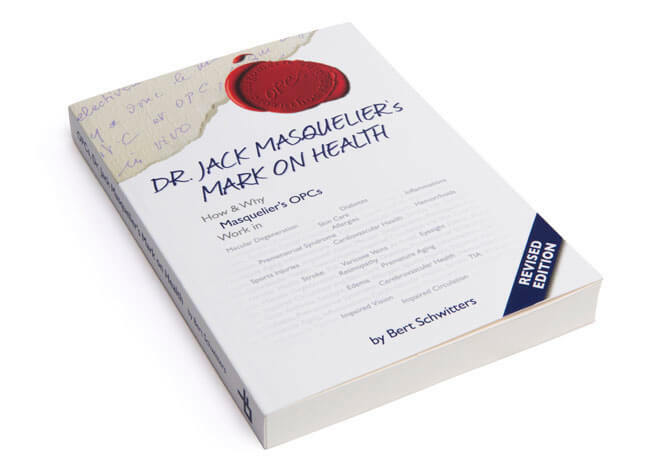 The researchers concluded that OPC acts as a “trump card” in the treatment of all cases of exudations linked to ischemia that are of a diabetic, arteriosclerotic, inflammatory, degenerative, and myopic nature. In 1981, the effects of OPCs were investigated again on 26 diabetic retinopathy patients. During 5 to 21 weeks (average 51 days), they took 100 mg of OPCs per day. The researchers concluded that, especially in cases of developing diabetic retinopathy, taking OPCs indisputably has a favorable effect, especially on unduly widened small blood vessels (microaneurysms) and deposits in the tissues of fluid containing proteins and cellular remains that has escaped from the blood (exudates). Once again, in 1982, researchers observed 30 diabetic retinopathy patients who suffered from aneurysms, hemorrhages, exudation, and neovascularization after a period of insufficient oxygen supply caused by capillary failure. The recommended daily dosage was 3 x 50 mg of OPCs. The results were again significant: In 80 percent of the cases it was possible to stabilize lesions in the retina.